Situated in the Lake District, this very special garden slopes down past the existing timber jetty and boathouse and into the lake. 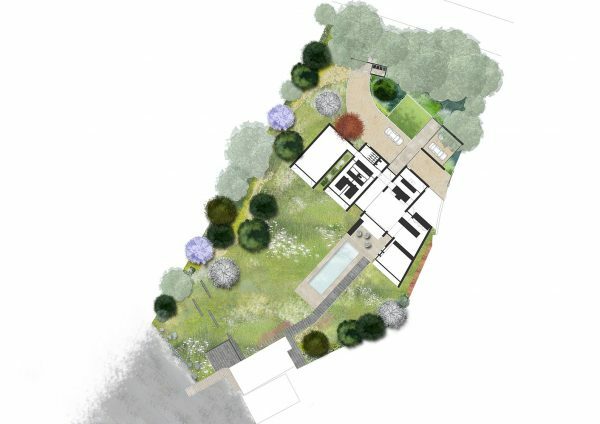 The owners were keen to retain the natural beauty of the existing site, with the long grass and undulating slopes, along with the sense of openness and space. The proposed new house sits in this natural setting and faces the incredible views across the lake. The main terrace steps down to a raised pool, flanked on one side with a stone path leading down to a second terrace by the boathouse. Slate seating steps extend out into the sloping grass and additional slate seats are half buried into the slope to create social spaces by the lakeside. A disciplined palette of materials ensures the natural feeling of the present site is retained. Additional boulders are added to those along the shoreline to create impromptu seating for lakeside gatherings. The lawn is retained as long grass with spring bulbs, and is cut infrequently allowing wildflowers to naturalise. Woodland planting to the east of the driveway includes a rich tapestry of ferns, bulbs, herbaceous perennials, while Japanese maples and white-stemmed birch trees create vertical accents against the backdrop of the existing mature trees. Boundary planting and trees at the entrance and along neighbours’ boundaries create a screen and natural transition, sympathetic to the rural setting. Planning permission was granted in August 2017.